Marla and Ken have each served as president of their local boards, on local, state and national committees for the real estate organizations. 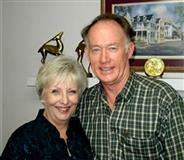 Ken was president of his Rotary Club, member of the Homebuilders Association, and has held numerous positions in the local, state and National Association of Realtors, as well as taught real estate and construction courses to Realtors. Ken serves as the 2006 President of Habitat for Humanity. Marla is active and a co-founder of the Anderson By Choice Club (ABC) which is a social club for new residents. Ken, a North Carolina native, has been in Anderson since 1967. Marla is a native Californian, having lived in New York, Michigan, and Arizona. They have four children living in Georgia, Ohio and New York, plus three wonderful grandchildren. Anderson has many benefits: 956 miles of shoreline around Lake Hartwell, affordable housing, small town benefits with two colleges, good medical and shopping, 30 miles to Greenville/Spartanburg airport and less than 2 hours to Charlotte or Atlanta. Welcome to a wonderful place to live!